One of the diverse Canary Islands, Fuerteventura is best known for it's natural beauty and incredible coastline, which stretches over 150km. But what makes this popular isle any different to your standard beach holiday in Spain? Besides the vibrant black sands, hidden coves and crashing waves occupied by surfers, being a UNIESCO-listed resort means you've got spectacular natural beauty and culture to discover too, from deserted islands that can only be reached by boat, to hiking across rugged volcanic terrain - you're sure to be blown away when you board flights to Fuerteventura. If you like the sound of that, here's 5 reasons we recommend a holiday to the Canary Islands - there really is something for everyone! Discovering the best Fuerteventura beaches is tricky when you’ve got a 150km-long coastline to choose from. That’s right, this Canary Island has a beach suited to every type of traveller, from secluded coves fit for your Instagram feed, to expansive tourist stretches and a blend of black and white sand. Popular resort town Caleta de Fuste is known for its golf courses and sandy sheltered beach, a perfect pit stop for families wanting fun in the year-round sun. The horseshoe beach here is man-made, with soft dark sands that gently shelve into the water - making it a great area for kids to paddle in. There are plenty of surf schools dotted in and around the resort for those that want to ride the waves – with one of the best places to put your skills to the test being Sotavento Beach, favoured for its steady winds in nearby Costa Calma. Esmeralda Beach is a laid-back, quite simple stretch also located in the resort town of Costa Calma. This small, golden-sand stretch is not overly touristy due to lack of access by car (via a dirt road next to Hotel H10 Playa Esmeralda) and has gentle waves. Or, if you’re looking for something a little more isolated, head deeper south to Cofete Beach – located down a 20km dirt track this idyllic cove is watched over by the Jandia Mountains. You now know which beaches to hit, but do you know the best hotels to stay in while in Fuerteventura? Browse a few of our favourite resort accommodations to secure your stay, today. 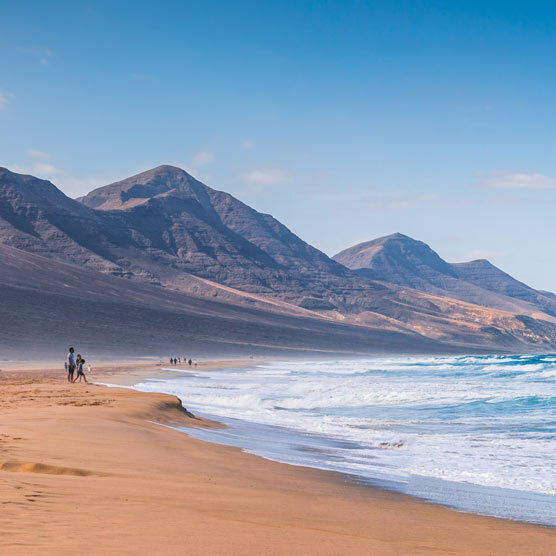 From the spectacular coastline to volcanic landscapes and lush nature reserves, Fuerteventura (along with the rest of the Canary Islands) is bursting with natural beauty. The island was crowned with the honour of UNESCO World Biosphere Reserve status in 2009, and in 2015 it was also recognized as a Starlight Reserve – making it a pretty magical place to visit. Isla de Lobos is one of a few sights that shouldn’t be missed. This idyllic miniature island can be reached by boat and it’s totally worth a day trip if you want to explore more of the surrounding island. Serving up a quaint beach, rare birdlife, tropical flora and fauna and its very own volcano, it’ll have visitors in awe. Talking of deserted spaces, Montana de Tindaya (in northeast Fuerteventura) is the oldest mountain in the Canaries. You’re not allowed to climb it unfortunately, however if you’re passing while en-route to La Olivia Village (another must-do itinerary wise), then it makes for a fantastic photo opportunity. The resort’s traditional interior villages are just as admirable as it’s vibrant exterior, with white-washed houses fitted with terracotta tiled roofs, swaying palm trees sprouting from the cobbles below and a mountainous backdrop to match. Betancuria, central inland, is one of the most beautiful complete with a 17th century baroque altar. El Cotillo in the northwest is equally as enchanting, complete with charming oceanfront restaurants serving up freshly caught seafood, and a medley of clifftop beaches to explore. In addition, maybe not a "natural" beauty as such, but definitely worth a visit is the open-air Sculpture Park located in Puerto del Rosario, featuring hudreds of scultpures designed by artists from all over the world - a great spot for a tourist photo, or two. The local specialties in Fuerteventura are what draw many visitors back to the island year after year – besides the beaches, of course. While it goes without saying that the resort’s seafood is excellent, cheese is in fact the real star of the show when it comes to authentic, local food. Cabra, or goat, is extremely popular in Canarian cooking and has featured in hundreds of traditional dishes over the years – it’s also responsible for the production of the island-famous Majorero cheese. Similar to Manchego, this firm cheese has a nutty flavour that compliments various sweet fruits such as pear – or can be grilled and drizzled with honey. So be sure to order it if you see it on the menu, or even better, head to one of the islands farm shops and grab a wheel. Other tasty traditions come in the form of papas arrugadas (wrinkled potatoes) served with a Mojo Picon sauce made up of olive oil, garlic, paprika, cumin and vinegar.